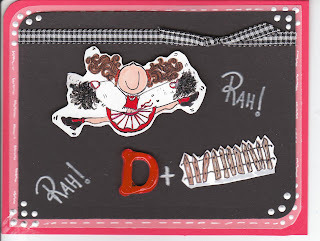 I saw the D-Fence card on susiestampalot.blogspot.com and knew I had to put my Bella's to work cheering on the "D-Fence"! The Storage Units, Inc and More's Whatchadoin' Wednesday Challenge was a picture of a bedroom with black and red linens for the colors. On my card I used red cs for the base, then a layer of vellum, and the top layer of black. The little Bella Cheerleader originally holds a purse in one hand and sunglasses in the other which I changed to pom-poms in each hand. The little fence is from AMuse and the small chipboard "D" is from Michaels. Thank you viewing my card and visit Susan's blog for the full story and challenge. I'm loving all your cards mom!!!!! I'm so glad you started your own blog. I always look formard to my subscription email "hug" from mom!